Coopers Landscaping Company - Driveways/Patios/Paths, Landscaper based in Swanley, Kent. Coopers Landscaping Company are a trusted, professional company with a great reputation to uphold. We are a family run business and have over 12 years experience in the trade. We are based in Kent, covering all surrounding areas. We work closely with our customers in order to guarantee complete satisfaction and peace of mind. No job is too big or too small, with our expertise ensuring that each project is properly organised and efficiently completed to the highest possible standard. Proper preparation is perhaps the most essential part of any project. We spend time ensuring that the ground is properly prepared in order to ensure a long-lasting and flawless finish. 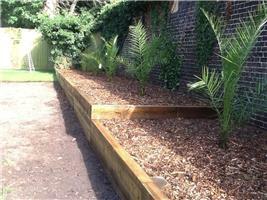 We specialise in landscaping gardening and garden maintenance. Our comprehensive services include: Full landscape design service Turfing Lawns Hard landscaping Block paving Garden maintenance Fencing Decking Small tree work Pruning Garden clearance Artificial Lawns/grass Patios Driveways Flower beds Ponds&lakes And many more tasks. If you are interested in any of our comprehensive services, please do not hesitate to contact us with a query or for friendly professional advice on the design, construction and maintenance of your outdoor spaces. We offer free, non obligatory quotes and estimates. Thank you for your consideration, we look forward to hearing from you. please mention Checkatrade when calling.